“What’s in a name?” asks Shakespeare. A very great deal if your name happens to be – but better use the alias the elf prefers in Half Past Wednesday, ≈/æπΩ. This tale by the Brothers Grimm tells about the Miller’s beautiful daughter obliged to make good her father’s boast that she can spin straw into gold. Threatened with dire punishment by the greedy, giddy King if she fails to perform this formidable feat by next morning, Erelda is helped by a mysterious elf who demands a fancy price for his supernatural savvy. A year later when the cruel bargain must be fulfilled, only way out for Erelda (who has since married the Prince) is to discover ≈/æπΩ’s name. That, mark ye, takes some doing and that, hark ye, is what Half Past Wednesday is all about! A words-and-music retelling of one of the most famous Märchen, or fairy tales, of Jacob and Wilhelm Grimm, Half Past Wednesday recently beguiled the young in years and the young in spirit at Off-Broadway’s Orpheum Theatre in New York City. In praising Robert Colby and Nita Jonas’s enchanting music and lyrics and Anna Marie Barlow’s libretto, critics used such terms as “gay and sprightly,” “mighty entertaining,” “engaging” and “ingratiating.” In all likelihood, you will agree with the critics that Half Past Wednesday is a superb musical show for children of all ages. ≈/æπΩ, That’s his name! And no one in the world has a name like that. But he does and that’s what causes all the trouble…. As our play begins in the land of There, way back Then (to be exact), the King’s subjects are on their way to the palace to present the King with offerings of all kinds – a goose, a ham, limes, and a lemony lollipop (“l’ve Got a Goose”). The King, however, wishes he were rich with gold instead of tiresome geese, hams, limes, and lollipops. He’s had enough of those! The King sings that he wishes he could afford to retire, play the flute and go barefoot in “What’s the Fun of Being King (If the King is Poor? ).” Just then a Miller and his beautiful daughter, Erelda, enter the King’s throne room. The Miller wants to appear more important than anyone else in the land and so he tells the King and his son, the Prince, that Erelda can turn straw into gold. “Straw into gold!” exclaims the King happily. “Just what I wanted!” He reminds the Miller and Erelda that if they are lying and she can’t make gold on a spinning wheel by morning, they both must lose their heads. It is the Law of the Land. Erelda is worried. How can she make good her father’s impossible boast? The handsome Prince falls in love with Erelda at first sight, and she falls in love with him, too. “You’re the Sweet Beginning,” the Prince sings to Erelda. But alone with the spinning wheel in a room of the palace, Erelda is unhappy. She knows she cannot turn straw into gold. Suddenly, a funny-looking little man with green hair appears (“Who? Where? What?”) – He is not at all nice, he tells Erelda. But if she will give him anything he wants he will help her. Erelda agrees. After all, she has lots of pretty things to give him: a locket, a ring, shiny buckles and a bracelet with a bell on it. It is nearly dawn, so the odd elf sets to work before it is too late and spins the straw into gold. As he works, the funny creature sings his “Spinning Song” to Erelda. Erelda and her father, the Miller, are saved! The gold delights the giddy King. But before he lets the Prince and Erelda marry, he wants her to spin more straw into gold. That way, the kingdom will be so rich that no one will have to pay any more taxes. “Everybody out of the room, except Erelda!” orders the King. “If You Did It Once, (you can do it twice),” they all sing to Erelda. After the Prince and Erelda remind one another “How Lovely, How Lovely” it is to love someone, the Prince leaves the room. The strange little man visits Erelda and once more helps her spin the straw into gold. But this time he wants her to give him something precious to keep him from being lonely. He wants the little baby she and the Prince will some day have after they’ve been married. Poor Erelda! She wants to keep the baby, but she also wants to keep her head. She remembers the Law of the Land: You Must Not Lie to the King. “All right,” she says to the elf. But she doesn’t really mean it. She plans to fool the little man and keep the baby despite her promise to him. It is a year later. Erelda has married the Prince and indeed they have been blessed with a lovely baby. Tiny clothes, diapers, thermometers, blankets, toys and all the things a brand-new baby must have are around its cradle, even a big birthday cake with a flag on it saying “Just Born!” The King has given the baby a wonderful grandfather clock that tells the day of the week, instead of the hour of the day. The King and Erelda’s father, the Miller, are now grandfathers and they are delighted. Together they dance a funny little dance as they sing about “Grandfather (Ev’ry Baby’s Best Friend).” Just then the magical but mischievous elf appears and claims his reward for spinning the gold – the new baby! In his song “To Whit – To Whoo” he tells them that he would like to do a lot of other mean things too, but he has half a heart and that makes him partly nice. So he will give them a chance to keep the baby. It is now half-past Monday by the grandfather clock. If by half-past Wednesday they cannot think what name his notes, ≈/æπΩ, stand for, he will carry the baby away with him to the forest to keep him company forever. How will they know when they’ve guessed his name, Erelda and the Prince want to know. “If anybody says my name out loud, I just disappear into the ground,” the little man with green hair and half a heart replies, “all the way through to China!” “What’s the Name of ‘What’s His Name’?” the baby’s mother and father, two grandfathers and the people in the palace wonder. What could it be? ≈/æπΩ isn’t very much help, after all. They try all sorts of strange names (you hear them in the song) but none seems to be the right one. The clock ticks away, getting closer with every tick and with every tock to half-past Wednesday. All of a sudden the Prince suggests they follow the crooked blueberry path. Perhaps that’s where the little man lives and perhaps somehow they’ll learn his name if they go there. What a good idea the Prince has had, for that is exactly where the little man is – in the forest, at the end of the crooked blueberry path. Erelda, the Prince, the King and the Miller go to find him. Meanwhile, before his house, the little man sings about the wonderful thing the baby will bring him, Companionship. He is so glad that one day, when the baby has learned to talk, he will be able to hear it say – and the elf pronounces his name. Erelda, the Prince, the King and the Miller, who have now found his house and have hidden themselves in the bushes nearby, hear him say his name! Hurrying happily back to the palace, they wait for the funny little man to come and claim the baby. “We Know a Secret Secret,” they sing. When he arrives, they say the elf’s secret name. It’s RUMPELSTILTSKIN! They have won after all, and Rumpelstiltskin is so furious he stamps his foot and disappears into the ground, just as he said he would. The music tells you where he’s gone. The baby can stay at the palace, after all, with his father and mother and his two grandfathers. Yes, sir! 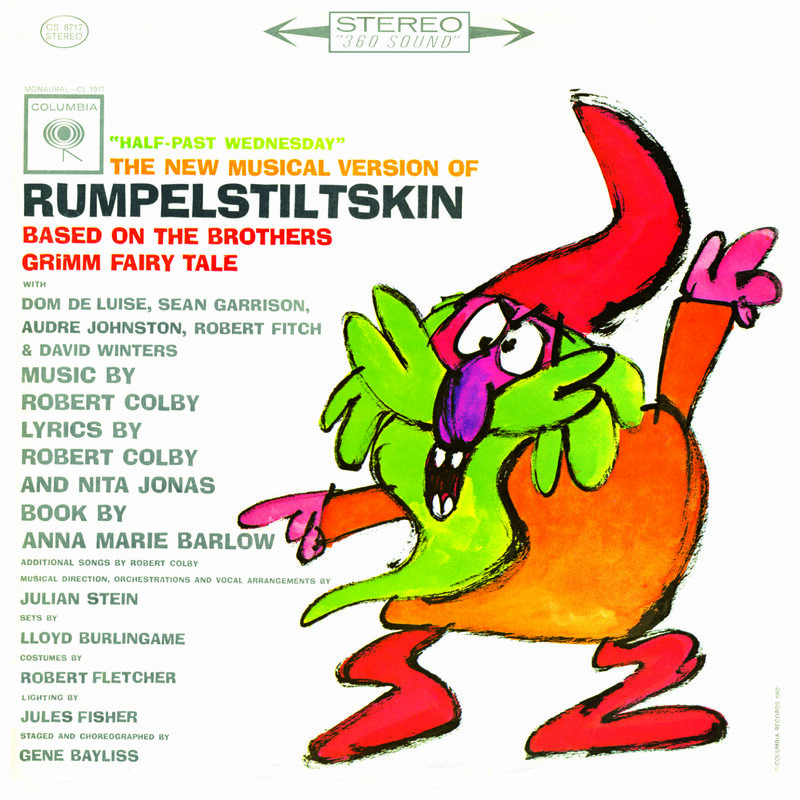 With a book by Anna Marie Barlow based on the German fairy tale and its treatment by the Brothers Grimm, music by Robert Colby and lyrics by Colby and Nita Jonas, Rumpelstiltskin (eventually re-tooled as Half Past Wednesday) opened April 6, 1962 at the off-Broadway Orpheum Theatre. In it, Dom De Luise, then a new comedian on the scene, played the King in the familiar märchen of a miller’s daughter who spins straw into gold with the help of an elf. Meant as a musical show for children of all ages, it didn’t find an audience and closed after playing two performances, though it reopened for an additional 4 performances, on April 28 and 29.